2012 was heralded as a momentous spiritual turning point in our species’ development. 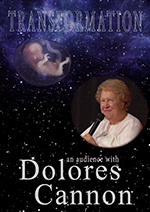 In this audience from that pivotal year, probably her best and one of the very last she gave before her passing in 2014, grand matriarch of metaphysics and past-life regression, Dolores Cannon, in her own inimitable, kind, mirthful way explains life and death, reincarnation and manifestation…and the very meaning of existence itself. Dolores taught her unique technique of hypnosis all over the world and was an international speaker who lectured on all the continents of the world. Many of her seventeen books are translated into over twenty languages.